If you’ve had to cut pay and staff and now expect more from those who remained, it’s vital to revamp your employee recognition and rewards program. Employers can double their rewards and recognition efforts in innovative, cost-efficient ways. Examples: employee-of-the-month awards, employee incentive pay, employee appreciation luncheons, more time off, shopping sprees, wellness incentive contests, plus employee rewards customized to motivate Millennials, Gen Xers, Baby Boomers and the Matures. Now is the time to get clever with your employee recognition programs. This special report, 12 Ways to Optimize Your Employee Benefits Program: Low-cost employee incentives, recognition programs and rewards, will show you how. Discover low-cost, inspiring ways—many of them suggested by Business Management Daily's readers—that your organization can motivate and express gratitude to your employees year-round. Surveys of U.S. workers consistently show that employees want more than a paycheck from their jobs—they want to feel safe, secure and appreciated at work. Clarification of what behaviors and outcomes the organization values. Reward everyone who meets the criteria. Remember: You get what you reward. The bottom line: Remember that employee incentives come in many forms, not just cash. For top performers, increased responsibility and lessened supervision can be rewards in themselves, as can flexible schedules, additional time off, first pick of desirable assignments, and so on. The point is that employees must indeed feel that you are rewarding them for both working hard and getting results. Employee recognition: Have you hugged your employees today? You might think that employee recognition is about the rewards you give workers for long years of service or for retiring after a notable career. It’s really not. Employee recognition is about engagement. And employee engagement starts with employer engagement. How engaged are you with your employees? Do you know their names? Their goals? What makes them tick? Recognition doesn’t have to be about gold watches or cash bonuses. It’s even more effective when it’s about relationships. Continue (or start) to appreciate your employees and recognize them for what they do. Know their names, their stories. Let them know yours. Let them in on the organization’s mission, vision and values. Establish trust. Learn the Golden rule of employee recognition in 12 Ways to Optimize Your Employee Benefits Program: Low-cost employee incentives, recognition programs and rewards. Here are 6 low-cost ways—suggested by Business Management Daily's HR Specialist Compensation & Benefits readers—that your organization can show gratitude to your employees all year. Embarrassment committees. To celebrate a person’s annual anniversary on the job, form an “embarrassment committee” to make a ruckus as colleagues deliver a cookie bouquet and gift card. Employee Appreciation Week. During one special week, serve breakfast one day, lunch on another and a make-your-own-sundae party on a third. Children’s art contest. A couple of times a year, exhibit around the building artwork that employees’ kids have created. Door prizes for staff meetings. To add some fun and encourage attendance, hold a drawing for a small door prize before all-staff meetings. “You’ve been caught” program. Encourage managers and employees to notify HR when they “catch” a colleague in the act of going beyond the call of duty. At monthly staff meetings, introduce all nominated employees, and mention what the person did. Choose one winner at random for a gift certificate to a local restaurant. Baby blankets. Send blankets to every employee who welcomes home a new child. Most organizations choose rewards based on budgets, tradition and management choices. Or they may use surveys that solicit preferences but don’t analyze the results according to generational differences. That’s a mistake more organizations are trying to rectify. Nearly a third (32%) of HR professionals plan to alter their total employee rewards programs with generational preferences in mind, according to the new Top Five Total Rewards Priorities survey by Deloitte LLP and the International Society of Certified Employee Benefit Specialists. That percentage is likely to increase significantly in the future because the workforce is becoming more multigenerational—especially as older workers remain longer to rebuild their nest eggs. More organizations are customizing employee rewards programs to accommodate the values, lifestyles, work habits and interests of different generations. Even low-budget programs can offer rewards that appeal to different generations. 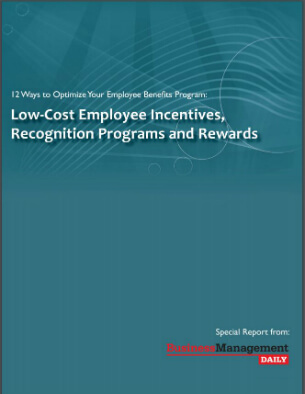 Discover what the death of one-size-fits-all benefits means to your company and how to tailor your employee rewards program by generation in 12 Ways to Optimize Your Employee Benefits Program: Low-cost employee incentives, recognition programs and rewards. The problem with standardized reward and recognition programs is that they are completely impersonal processes. Instead of thinking about the specific people involved, the company provides the same generic awards to everyone. But when an element of fun and play is added, the experience becomes personalized and much more memorable for the award recipient, without additional financial expense. If you can make the reward and recognition process fun, your employees will talk about the event long after it’s ended, and you will have multiplied its team-building impact many, many times. Employers host employee recognition events throughout the year, but the first Friday in March is the official Employee Appreciation Day. Buy bagels or lunch for the staff, close shop early or just say thanks. Appreciation phone calls from the CEO—to employees at home. “Take a walk in my shoes” video for the staff showing what one employee did during a typical day. “Roast, Toast and Boast” lunches in which managers would roast a long-time employee, toast new hires and boast about a company accomplishment. Do-it-yourself titles. Employees were allowed to create their own titles (e.g., a deli manager called himself the “deli-lama”). “Coins” peer recognition program. Employees get three coins each quarter to distribute to co-workers who perform beyond the call of duty. Employees cash in their coins for prizes. Secrets of success videos. Long-time workers reveal theirs on videos that are shown to new hires. First, employers suggested … then they encouraged … then pleaded. Now, more U.S. employers are turning to the almighty dollar to get their employees to change their pound-packing, chain-smoking, sedentary ways. Despite the sour economy, more employers are creating and expanding wellness programs. And they’re increasingly turning to financial rewards and penalties to increase participation. Read 7 case studies of employee incentives and disincentives to encourage wellness in 12 Ways to Optimize Your Employee Benefits Program. “The number-one reason managers don't give recognition is that they don't know how,” says Bob Nelson, author of 1001 Ways to Reward Employees. That’s why HR professionals need to teach supervisors how to give employee recognition and provide them the tools to make it easier. Studies consistently show that “feeling appreciated” is a key reason employees stick around. And by making employee recognition a companywide effort, you remove a burden from you and make rewards more personal. Get Nelson's 6 guidelines for effective praising in 12 Ways to Optimize Your Employee Benefits Program. Nearly eight out of 10 (79%) executives polled in a recent survey said some form of gift giving occurs in their offices during the holiday season. But it’s not all bottles of wine and Target gift cards out there. When asked to name the most unusual or unique gifts exchanged in the office, responses ranged from a fully stocked 125-pound aquarium to personalized bobbleheads. Nothing takes the shine off an employee achievement award faster than having to pay taxes on its value. However, it’s entirely possible to design an employee recognition program that doesn’t cause tax liability for your employees—and is fully tax deductible for your organization. Caution: You can’t use an awards program to disguise taxable compensation. For example, the IRS will probably look askance at employee awards that are handed out at the same time as annual salary reviews. Similarly, the program cannot be substituted for a cash bonus plan that previously existed. Still handing out engraved pens and five-year pins to worthy employees? That’s not what they want. Workers say gift cards make the best employee gifts, rewards or incentives, according to surveys. But buying gift cards from stores during a recession could be risky. Before you spend your incentive budget on cards that generate more problems than appreciation, do some homework. Learn 6 ways to make sure your organization doesn’t waste its money on gift cards that don’t deliver. Sign up for 12 Ways to Optimize Your Employee Benefits Program. Since San Joaquin Gardens, a continuing care retirement community in Fresno, Calif., began handing out candy bars and $100 bills, employee turnover has dipped 6%. “You’d be surprised how little it takes to increase the morale of employees,” says Lois Manley, the facility’s HR director. The handouts are part of an employee recognition program that pats workers on the back for exceptional service to residents, who live in independent or assisted-living units. The program also rewards employees for longtime service, perfect attendance, accident-free performance and participation in a wellness program. The effort began as a way to retain hard-to-keep health care employees and recruit new employees to the staff of 240. The organization names an Employee of the Month from among staff who have been nominated by residents or residents’ family members. Every nominee earns a candy bar. The one who becomes Employee of the Month is given a prime parking spot for a month and an extra $100. Once a year, the monthly winners vie for the Star of the Year award, which reaps the victor $500 and a limousine ride to a black-tie banquet.